Andrews Bald, elevation 5,906′. 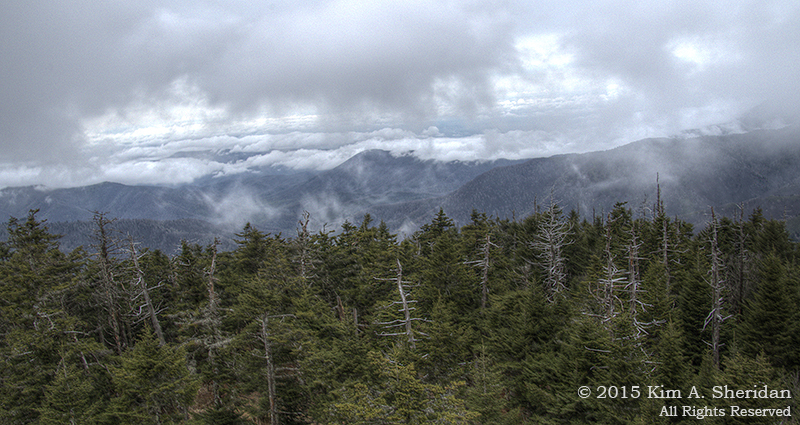 Clingman’s Dome, elevation 6,644′, the highest peak in the Smokies, the third highest mountain east of the Mississippi. Mt. 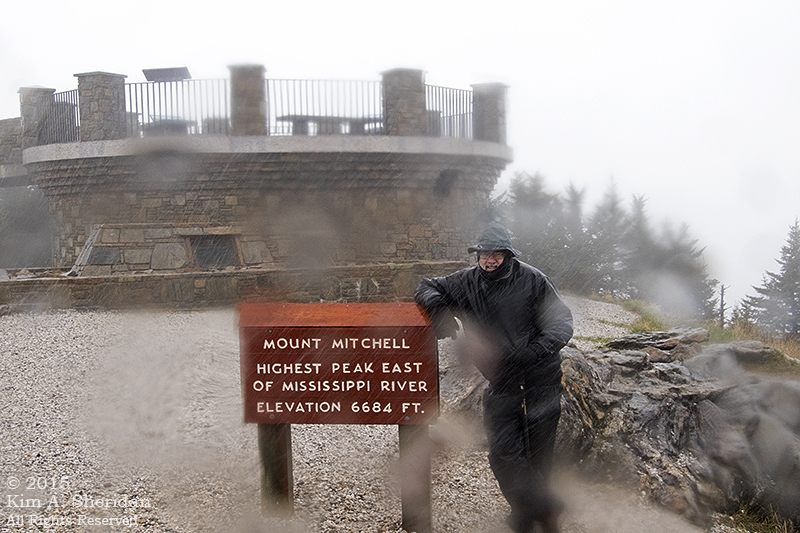 Mitchell, 6,684’, the highest peak east of the Mississippi. And we climbed them all. Many were the Appalachian Peaks that felt our boot steps. Now, can we say that Don and I climbed each of these mountains from bottom to top? No. But we did get to the summit of each. Even if getting there involved driving a nice cushy road to within a quarter mile of the peak, and walking from there! 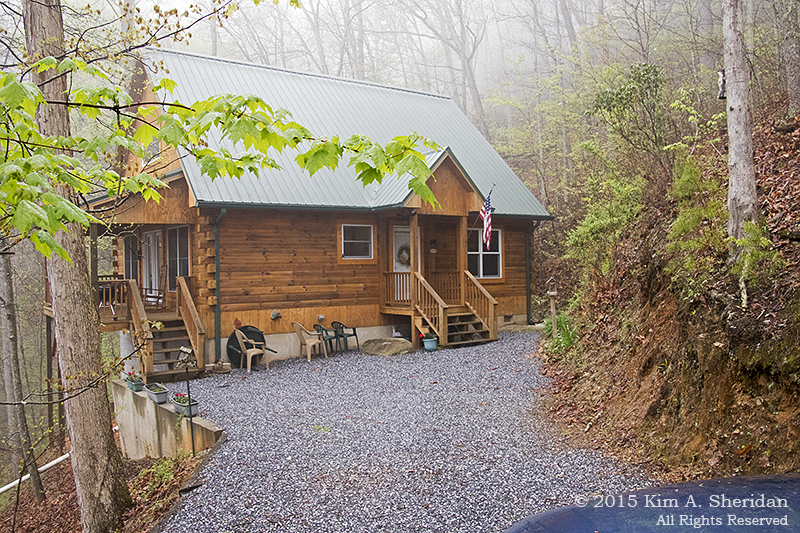 Life in the Smokies began and ended each day at Hummingbird Hollow, our little rental cabin in Bryson City. Just the driveway was an adventure. Perched on the side of a cliff and too small to turn around in, it was situated at the outer corner of a tight switchback. Don had to stand in the road to guide me in backing out. Then we’d crawl down a narrow winding gravel road to another blind corner, where he walked across the road to look for traffic before I could turn out safely. Then it was down more twisty country roads to town. I wouldn’t have traded it for the world. Our cabin was comfy and cute, a homey haven at the end of the long days. And a nice break from hotel rooms! 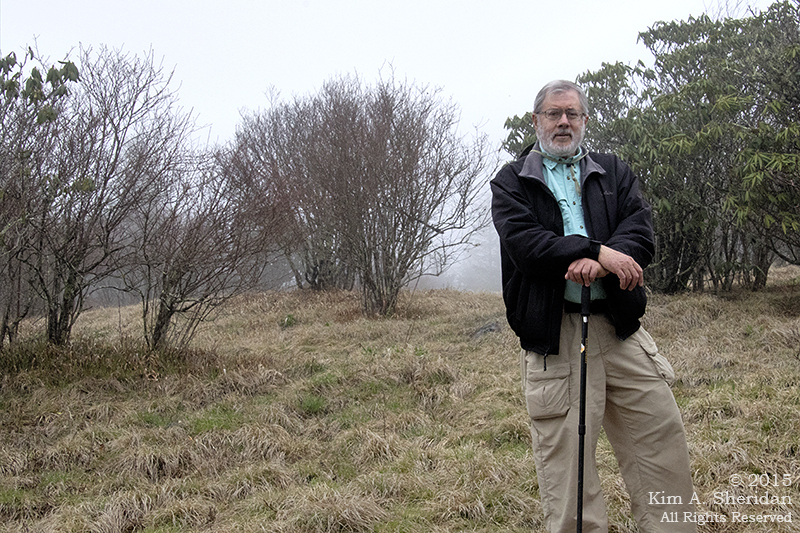 Don wanted to see an unusual mountain habitat known in the Appalachians as a bald. These are mountain tops devoid of trees, though there is no tree line in the Smokies. Some balds are rocky; others are covered with grasses and a few shrubs. Many people have speculated on how these balds came to be, and why they remain treeless, but no one really knows for sure. Maybe it was fire, or grazing, or dry winds… Whatever the reason for their existence, they are fascinating places. Don and I walked to Andrews Bald one day. This involved driving to the Clingman’s Dome parking lot, walking down the side of Clingman’s Dome on the Forney Ridge Trail, and then back up to the top of Andrews Bald. The day was damp and foggy (so what else is new? ), and it got damper and foggier once on the trail. We walked through a boreal forest dripping with mist. 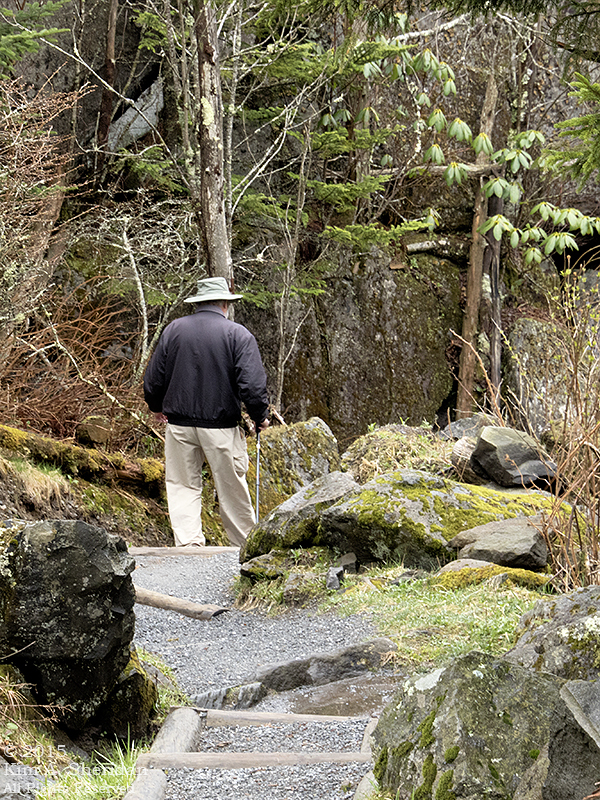 Don picked his way down the steep and rocky trail, over stone and log steps built by the trail crews. 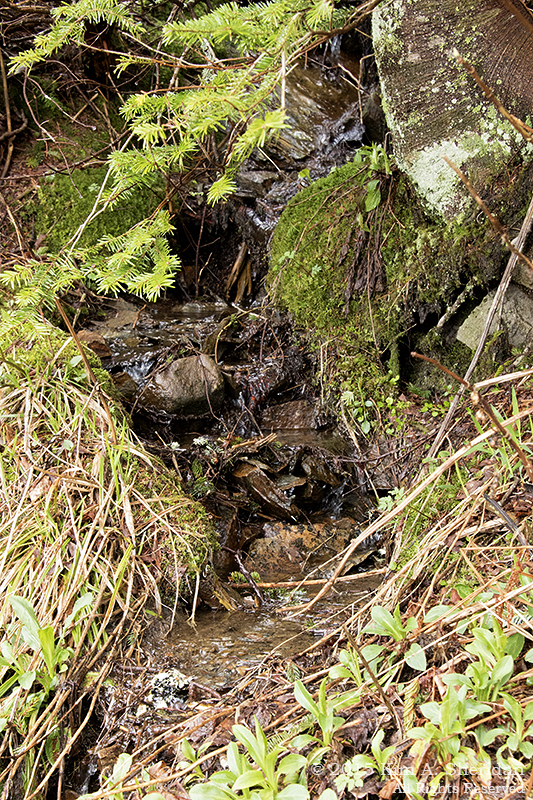 Every few feet a tiny run spilled out of the side of the hill, splashing over moss covered stones. After awhile, we left the rocky trail behind as we climbed back up to Andrews Bald, striding over ground made soft with the needles of spruce and fir. After a mile and a half, we saw the light at the end of the tunnel. The dark greenery of the trees shrouding the path formed the tunnel, and the light spilled from open meadows just beyond. We emerged into another world. Thick hummocks of tawny grass covered the ground. Mist drifted amongst widely scattered shrubs. Nary a tree in sight. The interesting thing about the bald was the abrupt transition from grasslands to trees. You are walking on a field of grass surrounded by fully grown trees high up on a mountain. Grass surrounded by trees happens in parks but is unexpected in the wild on a mountaintop since you’d expect as you get higher up to go from big trees to little trees to shrubs to just grasses somewhere above the tree line. A unique habitat indeed, and the grasses and shrubs were interesting. But I was captivated by the small things. Like a cluster of very tiny orange sporophytes on some sort of lichen. 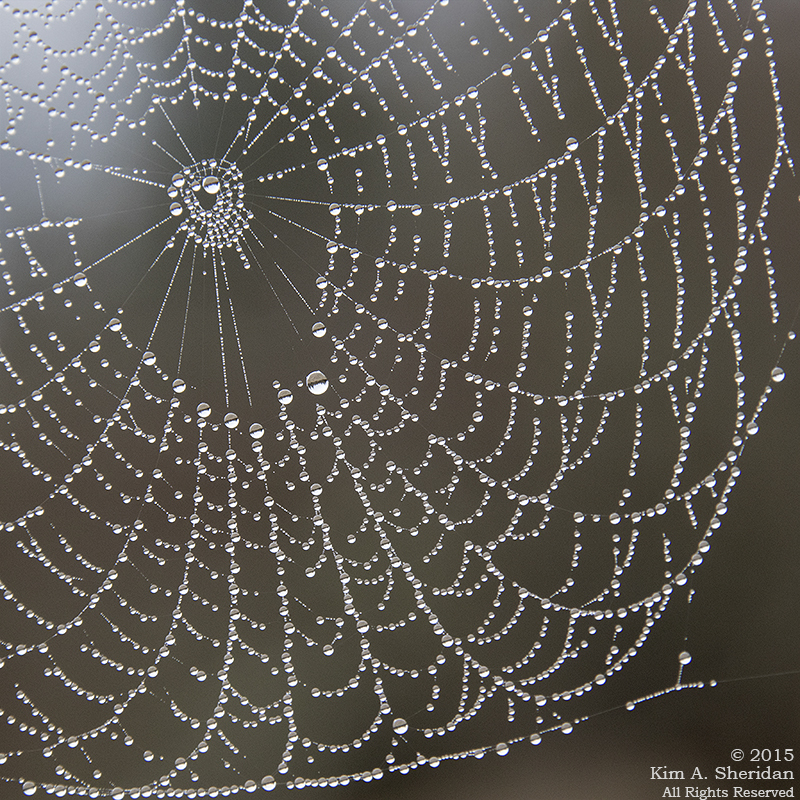 And a neat dew-laden spider web. 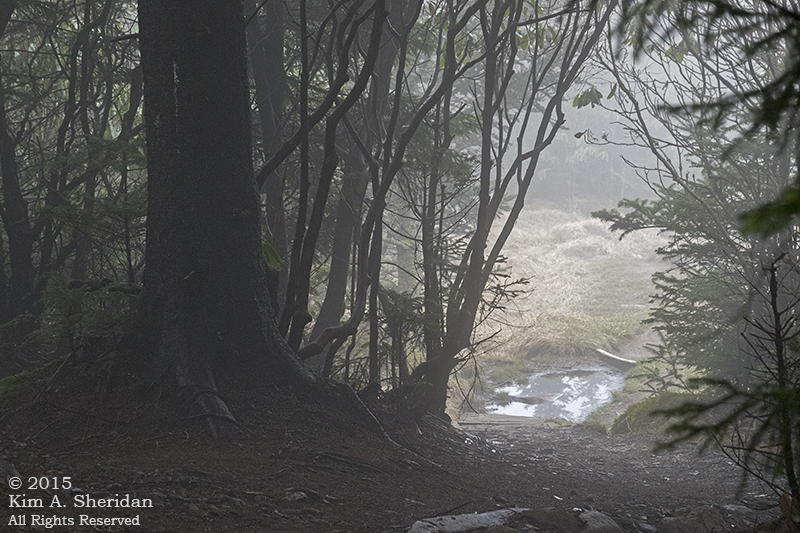 The fog started to break up, and we got hints of the spectacular views to be found here. Then we retraced our steps. Down, up. 3.6 miles of down, up, down, up; 1200’ of elevation gain (and loss) all told. 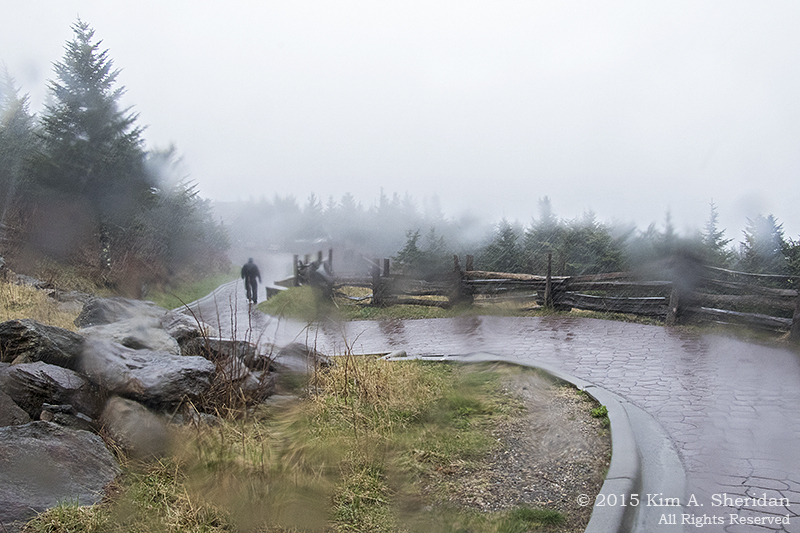 The half mile walk to the top of Clingman’s Dome awaited us. This was worse than Andrews Bald. Though it was just a paved, sloped path, it was relentless in its climb, with no variation in either topography or scenery to distract us from the 12% grade. 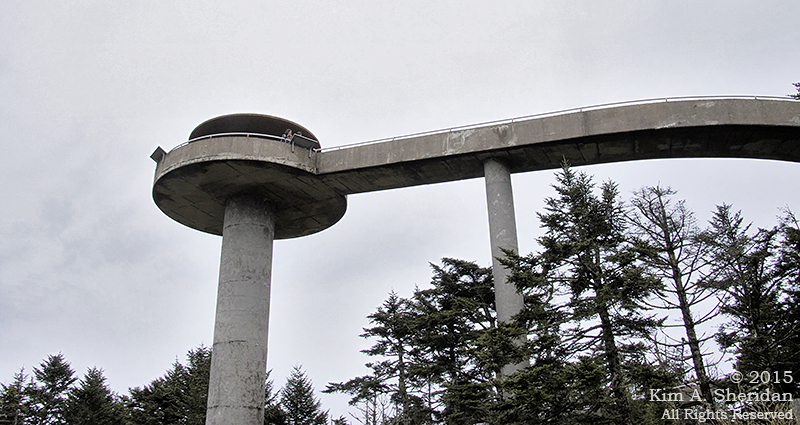 At the top was the Clingman’s Dome observation tower, a futuristic spaceship built in 1959. The long curving ramp swept us through the tree tops to the lookout above the spruces and firs. 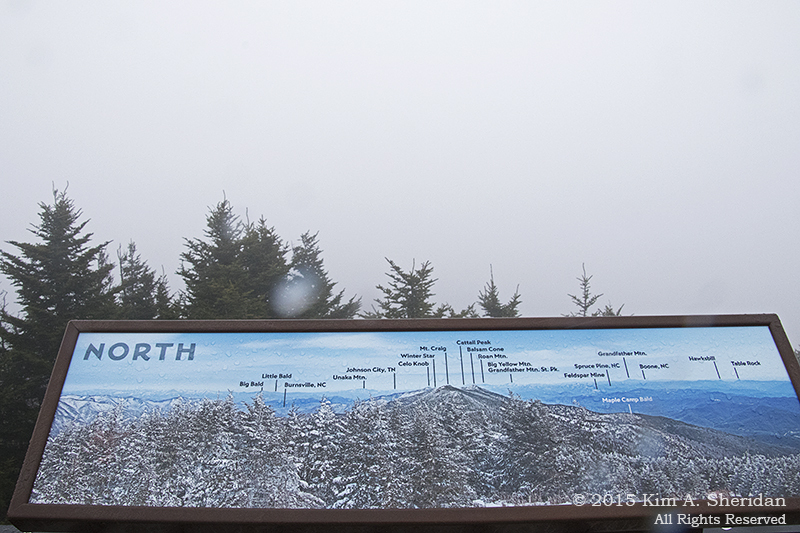 Without this tower, no one would see anything from Clingman’s Dome but trees. 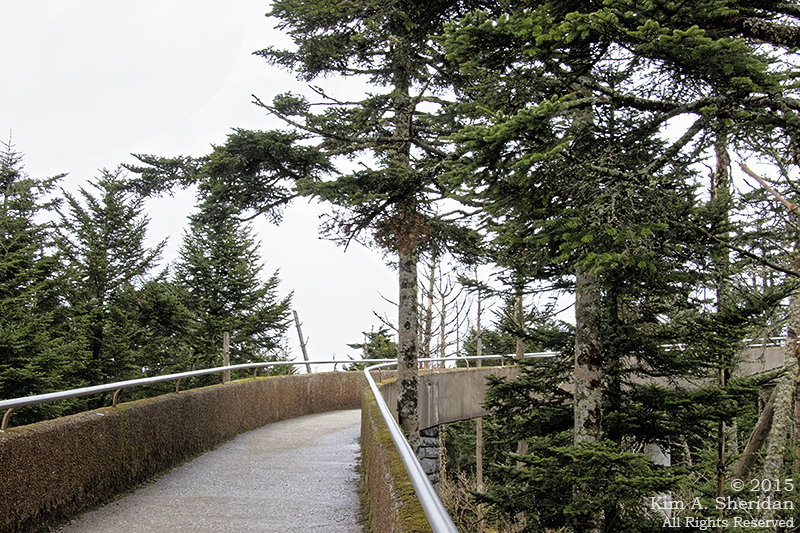 With the tower, from Clingman’s Dome we saw…Trees. And clouds. 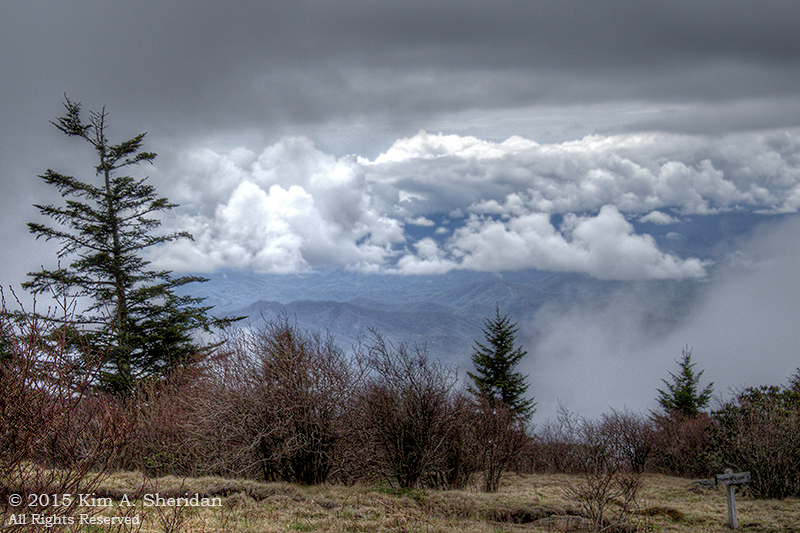 Ok, it wasn’t that bad; there were enough breaks in the cloud cover to see at least some of the mountains. Walking down was harder than walking up. Particularly on the knees. I was glad to reach level ground. By the end of this day, Don and I had walked 6 miles and climbed over 1500′ of elevation, all from a starting elevation of over 6000′. Down, up, down, up, up, down. Boy, were we tuckered! Our little cabin never looked as good as it did that night. 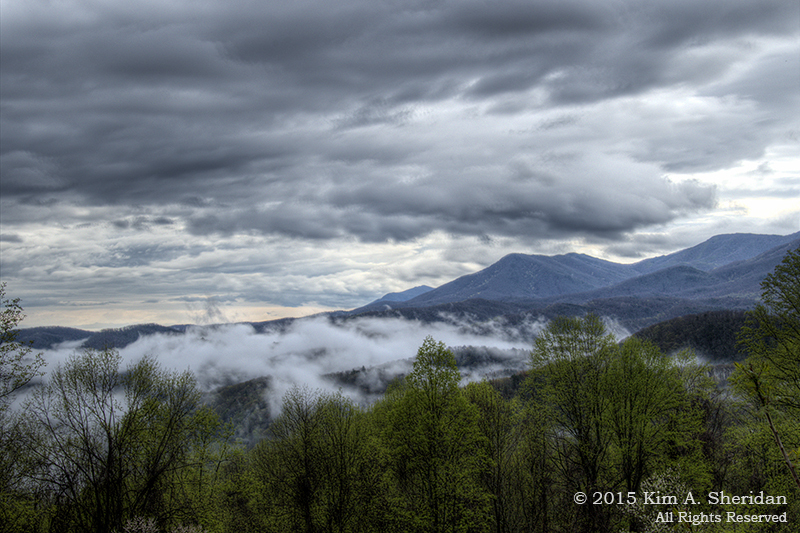 That was to be our last night there, and our last day in Great Smoky Mountains National Park. 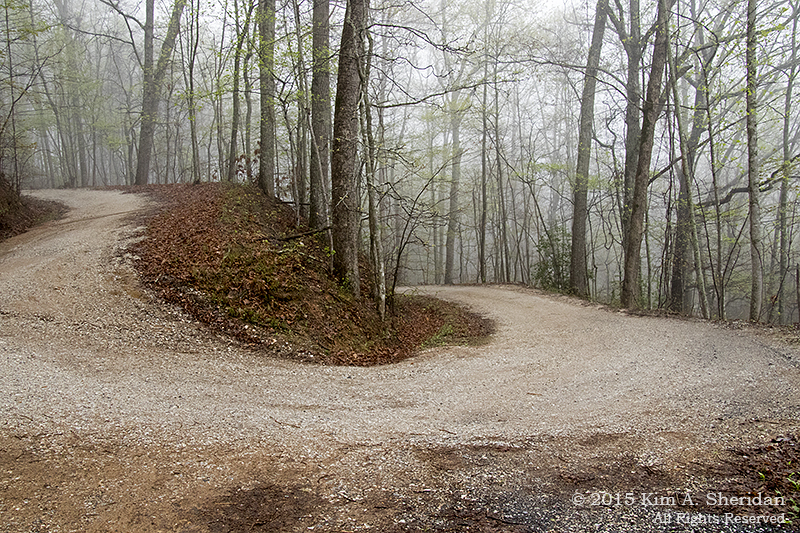 The next morning, we started our northbound journey on the Blue Ridge Parkway. On the second day, we visited Mt. Mitchell State Park, just a short drive off the Parkway. Mt. Mitchell is the highest peak anywhere east of the Mississippi. And from the parking lot to the summit it’s only a quick 280 yard walk up 300’ in elevation. Of course we could do that! Easy-peasy. What could go wrong? The weather, that’s what. This was one of the rainiest days of the trip, and the clouds pressed so close to the road we couldn’t see a thing beyond the grassy verge. On Mt. Mitchell, it was 47° and so windy it was raining sideways. Undeterred, we forged onward and upward. We saw nothing the closest trees. Our best views of the mountains that surrounded us came from the photographs on the interpretive displays. We had to take the mountains on faith. But at least we can say we climbed to the top of the highest peak in the Smokies, and to the top of the highest peak in the Eastern United States. I’ve got this lovely photo of Don enjoying a fine day on Mt. Mitchell to prove it. 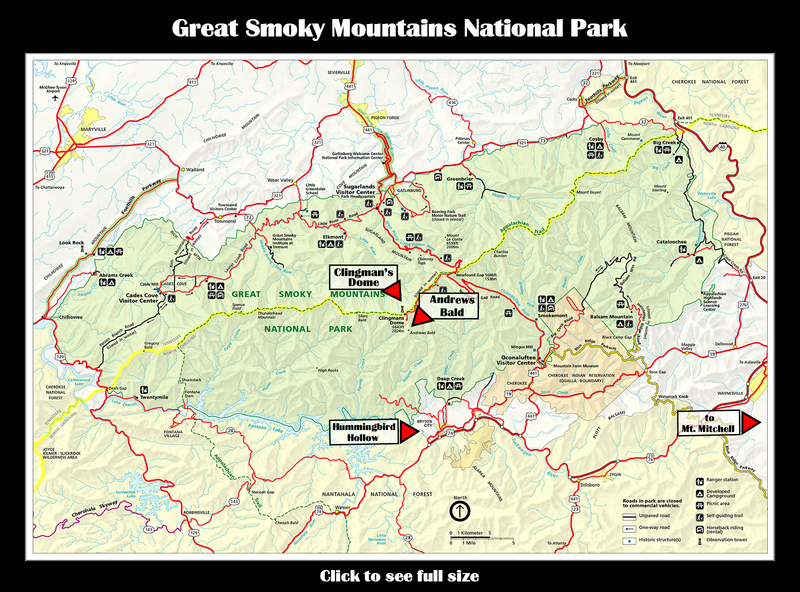 This entry was posted in Appalachian Mountains, Nature and tagged Great Smoky Mountains National Park, Mountains, Nature by Kim. Bookmark the permalink. That was quite a trip! I enjoyed every step with you!